Please keep your cursor outside of the image to see the broadband version, and place it over the image to see the narrowband, labeled version. The region around the star Sadr, also known as Gamma Cygni, is full of emission nebulosity (designated SH-108 which includes IC 1318). 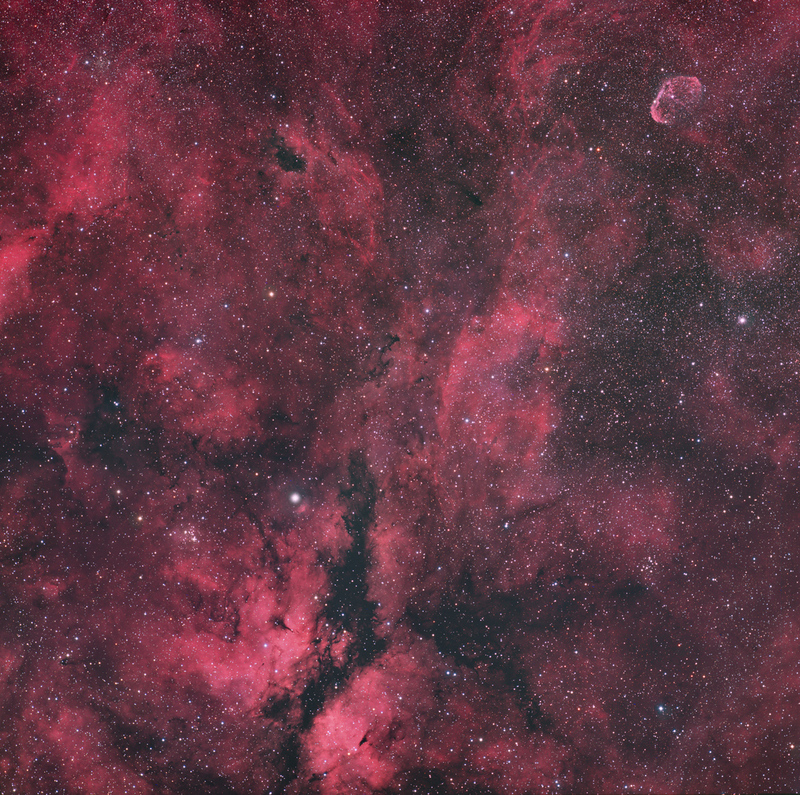 IC 1318B is located within the constellation Cygnus and is close to other famous landmarks along the summer Milky Way, like the Pelican and North American Nebulae, the Crescent Nebula (upper right), and the Bubble. This area is very rich sulfur, hydrogen, and oxygen gases which are excited by high energy stars in the region to emit in SII (around 672nm), HII (656nm), and OIII (around 495nm). The above image was taken with broadband (RGB) filters. A previous image of mine from 2013 shows a mapped color composite in which SII is mapped to the Red channel, HII is mapped to Green, and OIII is mapped to Blue (Hubble Palette). More information about this region can be found at Rob Gendler's website. Exposures: Total RGB exposure 9 hours.